Free Electrons is a small (9 people) engineering company focusing on embedded Linux / Android, and open source software, which also happens to have ported several ARM SoC to the mainline kernel. From time to time, they also offer training sessions, and release course materials publicly. Their latest training is a 3-day course dealing with the Yocto Project and OpenEmbedded, using BeagbleBone Black development board for lab sessions, and all materials have been released under a Creative Commons license. 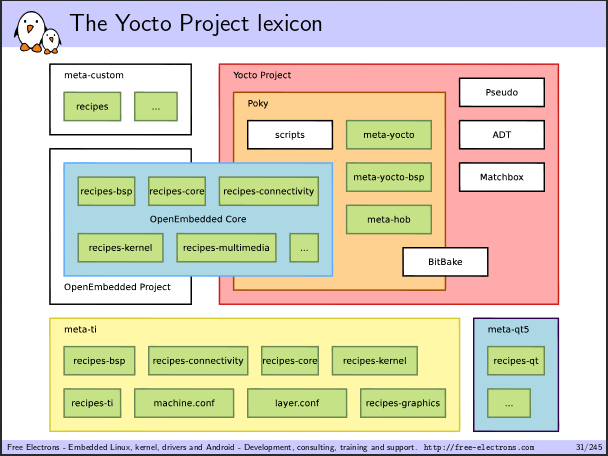 yocto-slides.pdf – Yocto Project and OpenEmbedded Training presentation slides (245 pages) give an overview of various build systems, before getting more details about the Yocto Project, and Poky distributions. yocto-labs.pdf – Practical sessions with BeagleBone Black board and a Nunchuk (Wii Remote). If you are interested in attending an actual training session, the company organizes a course in Toulouse, France on November 18-20, which costs 1690 Euros per attendee. free electrons provides great materials, however yocto is just unnecessarily complicated for most if not all embedded projects, it’s best fit for the legacy BSP companies(windriver,etc), but too much for small team and projects in my opinion.